The end of World War II saw the beginning of African decolonization and independence from European colonizers. It promised to be an era of autonomous development for African nations. However, the burden of colonial history and institutions, the polarized climate of the Cold War, and an increasingly globalized world economy, led to the implementation of policies that drastically affected Africa’s ability to develop free from Western influence. A very liberal view would argue that the African continent became a pawn in the Western world’s ideological battle against communism, a playground for resource extraction, and a guinea-pig for neoliberal economic experimentation. While this argument is clearly extreme, it is not far from the truth. The economic policies imposed upon African countries by Bretton Woods institutions were entrenched in Cold War politics and neoliberal ideology, severely undermining African development through the dawn of the 21st century. Africa’s social, political, economic, and geographical context is very relevant to its post-colonial development. The arbitrary borders drawn by European colonizers created countries that lacked internal cohesion. Tribes, cultures, ethnicities, and religious groups were illogically divided and contained. Volatile population dynamics and contentious resource distribution created environments rife with civil conflict, seriously challenging the future of African development. The continent has an abundance of natural capital, primarily minerals, metals, and oil. The central aim of European colonization was to profit off of resource extraction. It did so for centuries. The exploitative nature of European colonization robbed the continent of valuable resources and built institutions that favoured the wealthy, ruling European elite. Upon decolonization these institutions were often not restructured, but merely repossessed by African elites, further institutionalizing a system of inequality, corruption and social divergence. The 1960s in Africa was a decade of economic optimism and nation-building. Newfound independence brought with it a sense of nationalism. Resource abundance in a number of African countries made modernization a real possibility. However, decolonization was heavily embedded in Cold War politics, and the ideological vacuum in African countries posed a serious threat to the West. Newly established African governments inherited countries with limited industrial infrastructure, poor social services, endemic poverty, unreliable tax bases, and volatile revenues from commodity exports. Rapid modernization required external funding so Western governments and institutions provided conditional financial support to keep African governments of their choosing afloat and within their sphere of influence. However, corrupt and illegitimate governments that openly declared themselves as anti-Marxist were financially rewarded by the West. The Congo is a very clear example. Joseph Mobutu was a key figure in the 1961 political coup and assassination of Patrice Lumumba, the Congo’s first democratically elected Prime Minister, popular for his socialist views. Mobutu, an avowed anti-communist, was politically and financially supported by Western governments who turned a blind eye to his anti-democratic principles and corrupt ways. He was notorious for siphoning Western aid and Congolese natural resource revenues into personal accounts. The ramifications of such poor governance and self-interested foreign influence in the Congo are clear examples of the failures of African decolonization during the Cold War. To this day, the Congo remains ravaged by corruption, civil war, and unregulated resource extraction. The decolonization of Angola in 1975 is another striking example. The twenty seven year long Angolan civil war is often described as a proxy war between Western liberalism and Cuban and Soviet communism, and was absolutely disastrous for development. Given the tense political climate of the Cold War and the economic disarray of the African continent throughout the 1980s, the scepticism surrounding the implementation of SAPs was justified. These programs facilitated the import and export of goods and materials, allowed for easier foreign direct investment, and limited government intervention. As these policies failed to bring the economic growth they promised, the United Nations and other invested institutions conducted extensive research into why such growth never came to fruition. It became clear that foreign direct investment was largely confined to resource extraction, and the capital flight associated “reduced the financial resources available for productive investments.” (Sundaram et al., 2011) Resource extraction by nature is a capital intensive and highly skilled industry, which neither expands employment opportunities nor allows for export diversification. Its revenues are vulnerable to exogenous shocks which, in times of crisis, exacerbate national trade deficits. Investment in resource extraction did very little to foster economic growth and development in Africa. The SAPs emphasis on limited government intervention detracted from public investment in social services and infrastructure, limiting employment and tax-revenues. Forced trade liberalization and the premature government limitation severely undermined development prospects, as the infrastructural capacities of productive industries were “not sufficiently competitive to take advantage of any improvement in market access.” (Sundaram et al., 2011) The statistics reflect the total failure of these policies. Nigeria’s per capita income went from $800 to $380 between 1985 and 1987. The minimum wage in Kenya declined 42 percent in this decade, and the percentage of children stunted by malnutrition rose from 24 to 28.” (Meadows, 1989) Studies found that in Zambia unemployment rose to 80% as a result of the privatization of state owned enterprises. Trade reform is often accompanied by the accumulation of debt. While this is a natural process of economic reform, its consequences were much more severe in the developing countries of sub-Saharan Africa (SSA) than in developed Western countries. The African Development Bank studied the impact of SAPs on government debt, and found that in SSA, trade reform eased imports more immediately than it increased exports. For commodities exports, external factors such as global price and demand are often more important determinants of export revenue than national policy changes in tariffs and tax. (Ackah and Morrissey, 2005) SSA did not have the infrastructural, institutional, or productive capacity to increase its export volume at the rate of its imports, and this worsened national trade deficits. 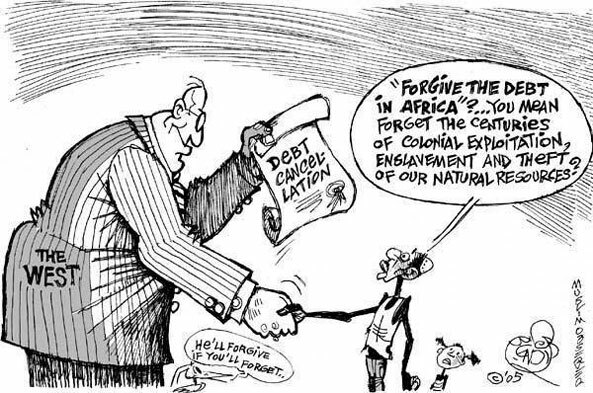 (Ackah and Morrissey, 2005) The 1997 UN Human Development Report found that sub-Saharan African governments transferred to Northern creditors four times what they spent on the health of their people (Human Development Report, 1997). The human consequences of diverting valuable resources to finance trade deficits and debt service payments have been immense. The correlation between economic shocks and civil conflict is as evident as it is shocking. A 2004 study on this relationship used the African continent as a case study because of its continuous struggle with civil war after decolonization. This research drew alarming conclusions on the strong correlation between economic volatility and civil conflict, stating that “a five-percentage-point drop in annual economic growth increases the likelihood of a civil conflict…in the following year by over 12 percentage points—which amounts to an increase of more than one-half in the likelihood of civil war.” (Miguel et al., 2004) It was no surprise to then find that in SSA, “29 of the 43 countries suffered from civil conflict during the 1980s and 1990s,” arguably as a direct result of the economic turmoil incurred by SAPs. (Miguel et al., 2004) The consequences of conflict and human suffering can be irreparable in nations with already limited state and economic capacities. Civil conflict destroys social relations, livelihoods, communities, and in very sterile terms, diminishes human capital for generations to come. It feeds political upheaval, destroys industrial and communicative infrastructure, and deters private, public and foreign investment. The economic shocks that instigated civil conflict in Africa were caused by the policies demanded by the Western governments and international institutions that were financially committed to development projects. To this day, “Africa’s post-colonial states have a great number of ailments. Literally, they have the lowest access to running water, high famine rates, low literacy and education levels, and are generally at the bottom of the globe when it comes to development.” (Mann, 2012) This reality is largely a product of policies implemented throughout the decolonization period. African decolonization was shaped by Cold War politics and wrought with the economic and ideological self-interest of Western powers. The neoliberal policies enforced in African countries by Bretton Woods institutions plunged the continent into severe debt, diminished social services, ignited civil conflict, and stunted growth and development for decades. The policies adopted, or imposed, during the decolonization period are often criticised as a form of economic imperialism, drawing unsettling parallels to the era of Western Colonialism. ‹ East Asian Miracle: a myth or reality? › Why do we think West is best?